Khan Roshan Khan was a Pashtun historian, educationalist, politician and writer. Khan Roshan Khan was born in the village of Nawa Kalli, Swabi in 1915 and died on 19 November 1988. Khan Roshan Khan is usually famous for his research work on the history of the Pashtun nation. Khan belongs to the group of researchers who claims that Pathans are Bani Israel. That is, the theory that the Pashtuns are descended from the biblical Israelites. 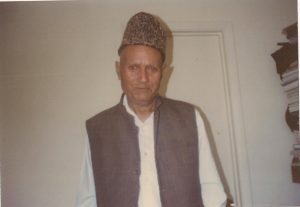 Roshan Khan was a major figure in contemporary Pashto literature. Roshan Khan was an active member of the Khudai Khidmatgar movement. He was very energetic in the Pakistan independent movement and was the president of the Swabi Muslim League. He wrote several books on the history of Pathans nation. These books are Tazkira, Pathanon Ki Asliat Aur Unki Tareek, which describes the races and origins of Pashtun tribes. Additionally, he wrote Yousafzai qaum ki Sarguzasht, which provides details on the various Pashtun tribes. Khan also authored Afghano ki Nasli Ttarikh, which describes the origin of Afghans(Pashtuns) from Bani Israel. Other booklets include Malika-Sawat, Baba-e-qaum Sheikhmali (RA) among others. His most important work is Tawarikh-e-Hafiz Rehmat Khani, which includes the details about the biographies of prominent Pathan leaders and elders like Hafiz Rehmat Khan, Hafiz Abdulsamad Alpuri, Ahmed Shah Abdali, Sardar Mohammad Khan and Dost Muhammad Khan etc. It also highlights the important events and battles of Pashtun tribes with other empires and tribes. Moreover, all the family trees of Pashtun tribes are also discussed in this book. All books of Khan Roshan Khan is now available on Pakistan virtual library for reading and download. Kindly check out the following links of each book to download it in Pdf format.